Truck Accident Injury Lawyers in Huntington Beach, CA - Over 40 Years of Truck Accident Experience You Can Trust! Are You Looking For Aggressive & Experienced Truck Accident Injury Lawyers In Huntington Beach, California? Our Huntington Beach, California personal injury lawyers possess extensive experience in handling personal injury accident claims and wrongful death accident claims involving truck, car, motorcycle and uninsured motorist (UM) injury accidents. If you or a loved one has been involved in a truck accident, or any type of motor vehicle injury accident, in Huntington Beach, Orange County, Los Angeles or any other place in California, because of a negligent or erratic truck driver, you just need to contact us now and we’ll take it from there. There are many time deadlines and procedural rules, including with the California DMV, police and insurance companies, so please do not wait and risk an insurer denying your claim. When a truck accident leaves you struggling with a devastating injury or the death of a loved one, you should seek the support of experienced and compassionate truck accident personal injury & wrongful death accident attorneys and their law offices. As the size of a truck is huge, collisions, including crashes involving very large big rig trucks, referred to as 18-wheelers, often result in grave injuries and damages to the occupants of smaller vehicles such as motorcycles and cars and sometimes even pedestrians and bicyclists. The resulting injuries can be catastrophic, requiring not just immediate and excellent medical care, but also expert truck accident legal advice to handle medical management, all legal procedures and recover the maximum monetary compensation for all injuries, loss of earnings, expenses and damages. Feel free to visit our Truck Injury Accident website to learn more about the truck accident injury claims process. 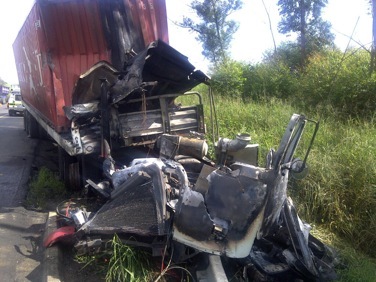 In fact, if you wish to learn more about our personal injury lawyers, and how they deal with truck accident and other personal injury & wrongful death accident claims, you can simply browse through the information available on our lawyer profile pages and our interesting testimonial pages pertaining to truck accident and personal injury cases. You can call our personal injury attorneys and law firm now at 818-222-3400 or toll free at 1.866 INJURY 2 (after hours, please press 1), or just click here for a completely FREE CONSULTATION. A seaside city in Orange County, Southern California, Huntington Beach is named after the American businessman, Henry E. Huntington. Huntington Beach is the most populous beach city in Orange County and in the Los Angeles-Long Beach-Anaheim MSA it is the seventh most populous. According to U.S. 2010 Census the population of Huntington Beach was 189,992. With the Pacific Ocean on its southwest, Seal Beach towards the northwest, Costa Mesa in the east, Westminster on the north, Fountain Valley on the northeast and Newport Beach on the southeast, Huntington Beach, California covers a total area of 31.9 square miles. This city is also the hometown of famous Hollywood and TV actor, Jason Lee. FOR A FREE HUNTINGTON BEACH TRUCK ACCIDENT CONSULTATION & CASE EVALUATION - CALL US NOW! Call us toll free at 1-866-INJURY 2 or 866-465-8792 or 818-222-3400 (after hours, press 1) for a FREE, no-obligation consultation. You can also email us at info@WalchLaw.com, or fill-out our simple contact us, to learn about your options.